A scene from last year’s Par 3 Challenge. See more photos and video from past events. The Bridge Golf Foundation will host our Fourth Annual Benefit Outing at The Bridge on Sunday, Sept. 23, 2018. This fundraiser is a vital day for our Foundation and will help fund the work we do every day to improve life outcomes for young men of color. Your support will also help to launch our new Learning Annex, a robust design lab and maker space that we plan to open in the fall. The annex will serve as a high-tech and hands-on workshop for our after school students and other families in our community. Foursomes are $10,000 and include four non-accompanied rounds at The Bridge as well as an annually-renewable membership to the Trustee level of our Friends of The Foundation program, which includes complimentary simulator play, special discounts and exclusive access to The Learning Center. 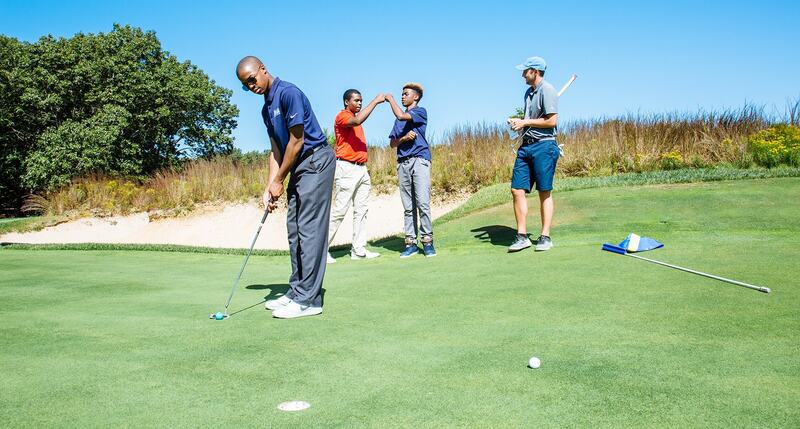 This is a phenomenal opportunity to enjoy a truly unique day of golf with friends and to participate in a Par 3 Challenge with the young men of our Foundation. We hope to see you there!